Transforming an industrial ruins into a waterfront center for Art, Ecology & Community Well-Being. Arm-of-the-Sea Theater has been bringing to life Hudson River history and ecology for 35+ years with expansive and accessible visual dramas. Now, at a long-abandoned site on the tidal Esopus Creek in Saugerties NY, we’re unpacking our storytelling toolkit and setting the stage for a multi-faceted visitors’ center with facilities for performing arts, exhibitions, river-related programs and citizen-science projects. The Tidewater Center will also feature a waterworks playground related to the historic water-powered mills of Saugerties, public access to tidewater fishing, and a way-station for mariners and kayakers. An eleven-member Steering Group is overseeing the planning process. Its members include an engineer, construction manager, logistics professional, visual artists, educators, and restoration ecologists drawn from Arm-of-the-Sea’s staff, board & associates. We have secured the services of Beacon-based design firm One Nature LLC. 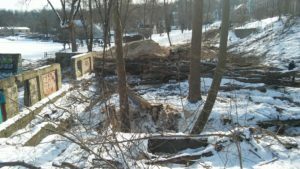 Planning for this project made possible by support from the Environmental Protection Fund, administered by the New York State Department of Environmental Conservation. 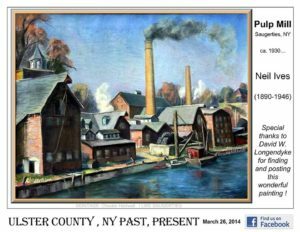 Painting by Neil Ives of former Sheffield Paper Company in Saugerties, NY.